Big in stature - big in flavor! 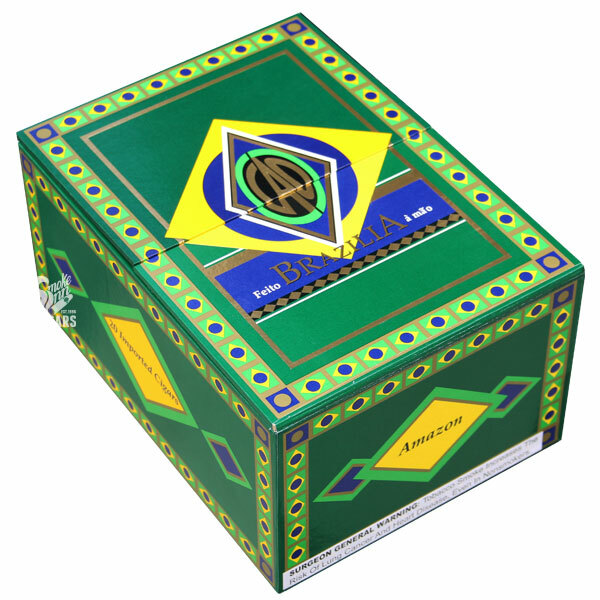 The CAO Brazilia continues the brand’s “world tour” of exotic tobaccos, this time focusing in on the unique attributes of Brazilian tobacco. Once eschewed by traditional manufacturers, Brazilian tobacco has since been accepted in the American market, thanks, to a fair degree, to the introduction of the CAO Brazilia in 2001. Where other manufacturers kept the dark, Brazilian component of the blend undisclosed, CAO flaunted the oily Arapiraca wrapper leaf. Not only this, but the cigar’s packaging and even the name fully embraced the region; displaying the country’s colors to let smokers know they were experiencing exotic tobacco. With a near-black wrapper of Brazilian Arapiraca and Nicaraguan fillers, the Brazilia takes on a full body that is brought to balance by an intricate sweetness. The cigars are bright and rolled in large sizes (50 - 60 ring gauge range), making for an eye-catching display in the humidor. Flavors are often described as rich—showcasing notes of leather, pepper, cedar, dark fruit, and bitter, dark chocolate. CAO Brazilia is now a staple in countless humidors the world over, paving the way for Brazilian tobacco in many of today’s biggest brands.